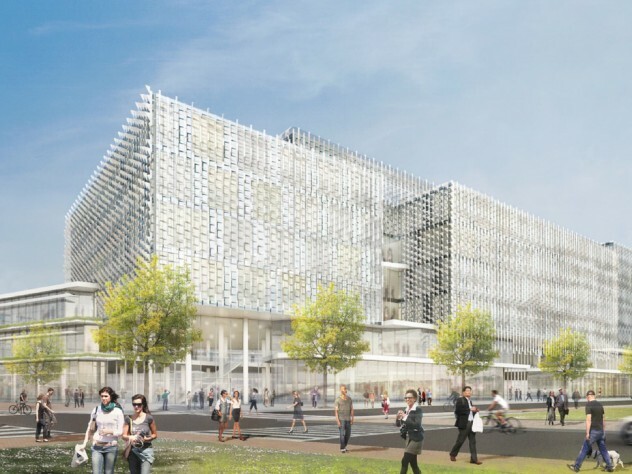 The long-anticipated Harvard Paulson School of Engineering and Applied Sciences complex in Allston has been approved by the Boston Redevelopment Authority and is expected to be completed in 2020. The Boston Redevelopment Authority (BRA) has unanimously approved Harvard’s plans for the $1-billion John A. Paulson School of Engineering and Applied Sciences’ (SEAS) science and engineering complex (SEC), giving the green light for construction to begin on the 556,850-square-foot building sometime this summer, with completion slated for 2020. Located across Western Avenue from Harvard Business School (HBS) and the i-lab cluster, and adjacent to the emerging enterprise research campus, the complex will accommodate more than 900 undergraduates on any given day. According to University officials, it will be home to more than 400 SEAS graduate students, 450 researchers, and as many as 80 faculty members. Associate vice president of public affairs and communications Kevin Casey told the BRA that Harvard was “thrilled” to present this project for final review and approval on April 14, calling it the first of a “mindful, purposeful” series of projects in Allston, and the “linchpin” of Harvard’s presence in the community. A south courtyard view of the complex. The outdoor lawn will be open to the public. The building is planned to foster “cross-disciplinary innovation within the school and across the University,” Casey said, citing the importance of SEAS collaboration with HBS, the i-lab, and the newly approved “Life Lab,” a 15,000-square-foot-building that will include 36 lab benches, tissue culture and microscopy facilities, a private faculty-in-residence lab suite, conference rooms, and collaborative work space for entrepreneurs. The complex—to be built on part of the foundation left behind in 2010 when construction was halted on a four-building science complex on Western Avenue—will be about 130 feet high. One-third of the interior space will be devoted to laboratories; the remainder will house classrooms, active learning labs, outdoor and rooftop patios, a café, an exhibition space, and a large atrium that will become “the heart of the SEAS community,” according to Robert Matthew Noblett of Behnisch Architekten—the firm responsible for designing the building. A new inter-modal public transportation station will open after the Mass Turnpike is straightened out, connecting the district to Kendall Square. BRA project manager Gerald Autler called it an “exciting night,” and the culmination of a 10-year process for the Allston community task force that went through many economic ups and downs, specifically the financial crisis of 2008. Autler called the SEC a “major building block for economic development,” highlighting the $25-million public and community benefits package Harvard plans to implement, as well as the retail shops and businesses that will be associated with the new building. A view of the atrium from the basement level of the complex. With approvals in hand, Harvard’s fundraisers can redouble their efforts to secure funding for the project, a high priority for The Harvard Campaign. The BRA also approved plans to renovate the Soldiers Field Park housing complex, on the eastern edge of the HBS campus, to modernize the graduate-student apartments. Work is expected to begin in June and conclude in 2020; the BRA indicated that the project would cost $183.5 million.